Place the butter in a saute pan set over medium heat. Once it melts, add the slivered onion and allow it to sweat for about 12 minutes, until translucent and soft. Increase the heat to medium-high, add the tomatoes and cook for about 2 minutes. Stir in the chile poblano rajas or strips, corn, salt and black pepper and cook for about 3 more minutes. Add the cream and queso fresco and continue cooking, stirring from time to time, until the sauce thickens a bit and seasons, for 2 to 3 minutes. Preheat the oven to 375 degrees. Butter a 8 x 11 or 9 x 9 baking dish. Layer the white rice in the baking dish and press it down gently with a spatula. Pour the poblano mixture on top. For the last layer, sprinkle the shredded cheese on top. Bake the casserole in the oven for about 20 minutes or until the cheese has completely melted. Serve hot. Will sour cream work in place of the Mexican crema or is it too thick? I recommend you substitute the crema with either creme fraiche or heavy cream. How perfect is this for no meat Fridays during the Lenten season?! WINNER! Has anyone tried to freeze this casserole? I’ve made it several times and my family loves it, but I’m having surgery soon and won’t be able to cook for awhile. I wanted to make some meals ahead of time and freeze them. Could this be frozen before finishing in oven or best after? I made this and it was INCREDIBLE! It’s so easy and simple, but delicious and filling. We watch your show every night it’s on and you are our favorite human on the channel! Thanks for the great recipes! Thank you so much Emily and Anelisa! What an honor to be your favorite human on the channel! So good! I loved it! I just added chicken but it didn’t need it! Served it with black beans and corn tortillas. 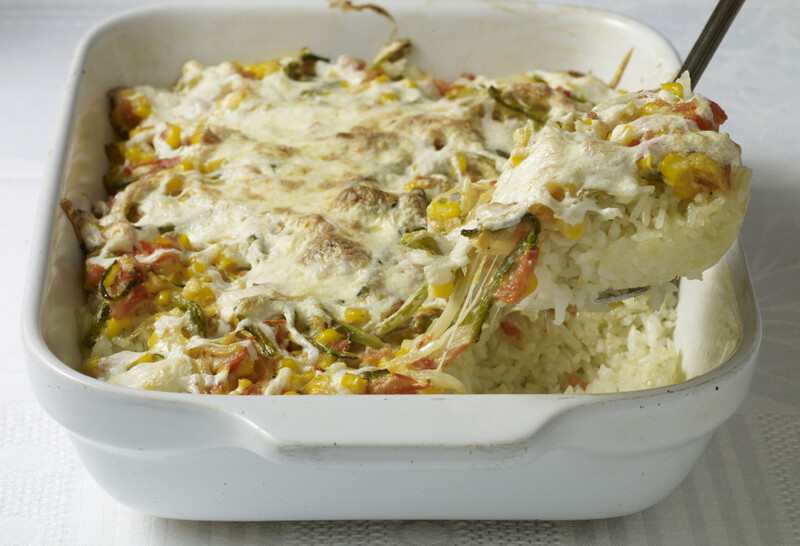 Pati, I thought when I first looked at the pic of casserole that it had shredded chicken in it. It sounds wonderful. Haha…I hope you try it Bonnie!